The Lucky Box is an item from Mario Party. 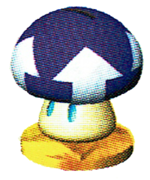 It can be purchased from the Mushroom Shop in Mushroom Village for 400 coins. Like the Coin Box, the Lucky Box stores coins and Stars, but after every round of partying, the player earns an additional 10% coin bonus from that round's total.